Being a Medici assassin has its perks. The Palazzo Medici held the famous bronze David by Donatello. 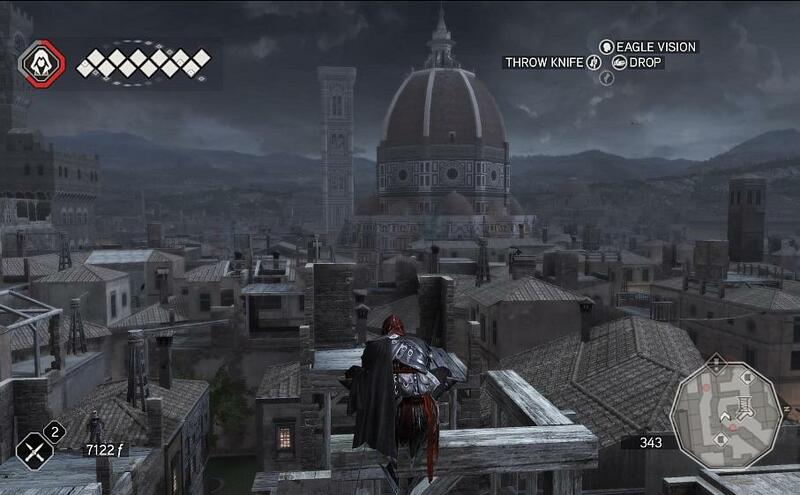 In Assassins Creed 2 you can gaze at it adoringly as if you were right there in the 1480s. This weblog usually isn't a place for video game discussion, there are plenty of places for that! However, when a video game is set in Renaissance Italy, and features an immersive experience unlike anything ever created in literature or film, it surely deserves a mention. Assassin's Creed 2 (AC2) is a video game produced by French/Canadian software company Ubisoft. It is the sequel to the highly successful Assassin's Creed (AC1), which followed the exploits of Altair, who belonged to an order of Assassins loosely based on the 11th Century order known as the Hashshashin, led by Hassan-i Sabbah. The sequel now tracks a descendant of this orignal Assassin. The Renaissance era experiences are related through Ezio Auditore, the son of a Medici ally, whom finds himself in great danger when the enemies of the Medici make a move for power. The events related have some basis in factual events and persons, but of course are also fanciful in parts for the sake of entertainment. To coincide with the release of the game, Ubisoft and Hybride Technologies produced a live action short film entitled Lineage. It depicts the settings and events that will shape the game, though focus on Giovanni Auditore, who is the father of the main character in AC2. You can now view Lineage in full directly from the player below! Great effort has been made by Ubisoft to create an immersive historical experience - making it quite unique among modern games. Other games exist which place you in historical eras, though these are most commonly strategy type games which are concerned with building cities and commanding armies. Assassins Creed breaks this tradition, and places your character directly in a period of history, in some beautiful and famous locales. The scene is set: In the short film Lineage, we are introduced to the locales and characters that are integral to the game, but were also at the heart of what we now call the Renaissance. History fans would delight at the idea of getting into a time machine, traveling to a particular time - and walking among cities such as Jerusalem and Damascus during the Crusades(as in AC1), or Florence and Venice during the Renaissance. This is exactly what the Assassin's Creed games allow you to do. Due to the way the game is constructed, you are actually required to run, walk and climb all over the cities. This is fun to do due to the game's use of a feature called the 'Havok Engine' which simulates climbing and grasping mechanics of characters in games in a very engrossing and entertaining way. It is definitely one of the strong points of this game and makes spending hours in these cities a fascinating experience. 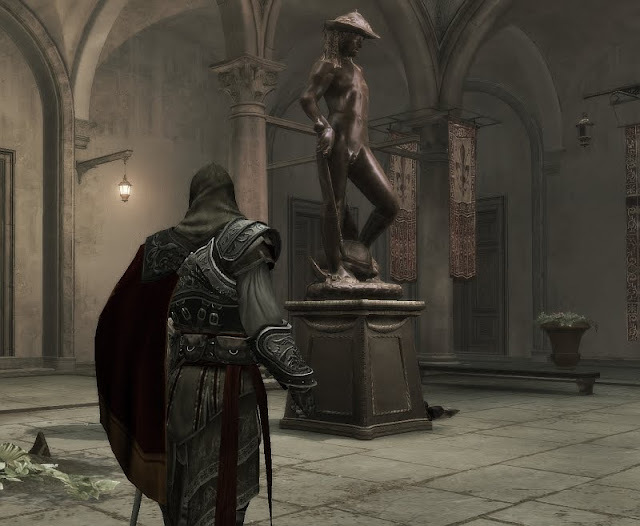 Ezio Auditore, an Assassin bent on vengeance stops to peer at the wonder that is Filipo Brunelleschi's Dome. At its completion, it was the largest dome built since Antiquity, but was eventually superseded in this honour by the Dome of Saint Peter's Basilica in Rome, which Michelangelo played a key role in designing. In the case of Assassin's Creed 2, Ubisoft have been able to add elements of real life history to the locales, including factual characters and events - as well comprehensive descriptions of the historical context of places you visit. These are woven into the story as you proceed - one particular level revolved around the riots caused by Dominican friar Girolamo Savonarola, a very real occurrence in Florence in 1497, known as the bonfire of the vanities in history, as it is in the game. Part of the missions involving Savonarola involve carefully climbing to the very top of the iconic Dome of the Basilica di Santa Mara del Fiore, famously designed and constructed by master architect Fillippo Brunelleschi between 1419-1436. As an assassin with ties to the Medici, you get to play a key part in the infamuous retributions that took place after the Pazzi conspiracy. The conspiracy leaders feature heavily in the earlier part of Ezio's missions, with in game commentary providing some details about the conspirators. In-game summary of the Pazzi conspirators. Mostly accurate, although the Templar ties are of course an embellishment to suit the game. 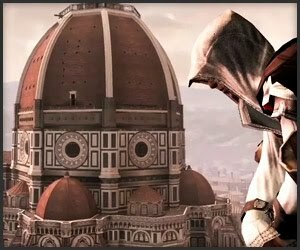 Take Ezio all the way to the top as well as explore inside the Santa Mara Del Fiore in Florence. Whilst the game does of course take some license in the aims of entertainment, there has been a high degree of detail paid to design of the locations. You can not see Michelangelo's statue of David because it had not yet been created during the the 1477-1496 period during which the game is set - yet you do intercept a letter from Michelangelo to his father proclaiming that he wants to be a sculptor, in spite of his father's wishes that he pursue a career in the Church - another quite factual detail. 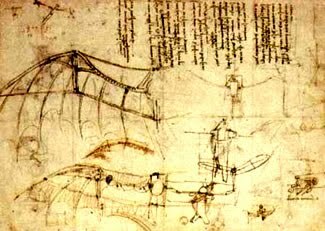 The original glider wing sketch from Leonardo's manuscripts. This sketch was based on observation of the anatomy of birds and bats. Owing to Leonardo's erratic and distractable nature, it is highly unlikely he ever got around to building anything like it. One of the most interesting parts of the game is when Leonardo da Vinci becomes a good friend of the protagonist. His main role is to assist in the deciphering encoded manuscripts and building new weapons from these documents. One of the greatest thrills in the game is supplied when you get to ride a prototype of the famous glider seen in Leonardo's sketches. The Leonardo in the game is fortunately a bit more organised than the real Leonardo was! 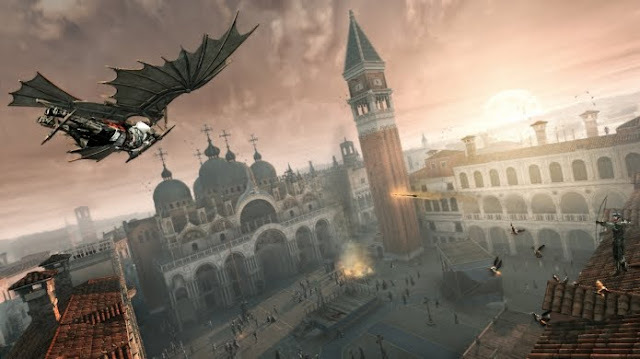 You get to fly his glider prototype around Venice, using heat rising from fires below to provide upward thrust. No story about Renaissance Florence is truly complete without a mention of the famous Medici family - the great Bankers of Florence whose wealth and patronage supplied work for the likes of Leonardo da Vinci, Botticelli and Michelangelo, and whose political influence eventually reached all the way to Rome, with one of the Medici actually becoming Pope(Leo X) in 1513. The protagonist of the game - Ezio Auditore, and his father Giovanni s depicted in Lineage, are in the employ of the Lorenzo de' Medici, also called Il Magnifico by his contemporaries. He was a great patron of artists, scholars and poets, but also described as a tyrant by his opponents. During the period depicted in the game, great strife was brewing between the warring City States that comprised Italy - Florence, controlled by the Medici wealth, had formed a tentative alliance with the equally powerful Sforza family of Milan. The powers in Rome saw this as a threat upon their spiritual and economic sovereignty. Galeazzo Maria Sforza was apparently a nasty piece of work. His brutal assassination threw Milan into turmoil, with the perpetrators eventually caught and brought to violent justice. This portrait was painted by Pietro Benci and hangs at the Uffizi in Florence. 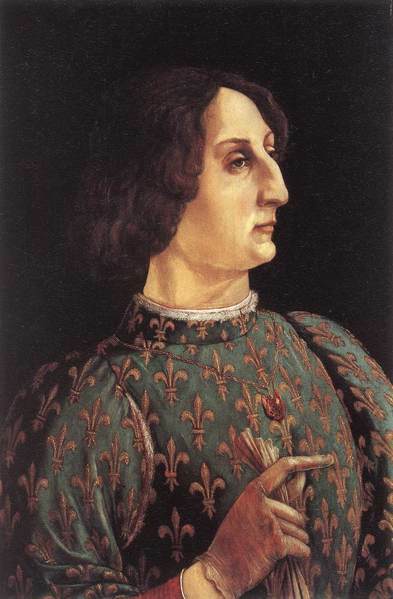 The opening section of Lineage shows us the infamous assassination of Galeazzo Maria Sforza. It is here we must pause in wonder and delight that this recreation is being done for a video game! In the age of massive online games and the dominance of science fiction, a game teaching you about the political intrigues of Florence in the 15th Century is quite remarkable, isn't it? I think it is! As the game progresses, you must travel to Venice - wonderfully recreated from the Canals to the top of the Basilica San Marco di Venezia. The time of your arrival coincides with the famous Venetian Carnival - and you are able to traverse the streets and canals of Venice during this - the entire city coming alive with color and sound. Gameplay video of Ezio stalking about in Vence during Carnivale. Beware the annoying minstrels! All roads of course lead to Rome, and Ezio is soon on the heels of one Rodrigo Borgia. A charismatic yet corrupted nobleman of Spanish origin, with close ties to the Pope Innocent III. 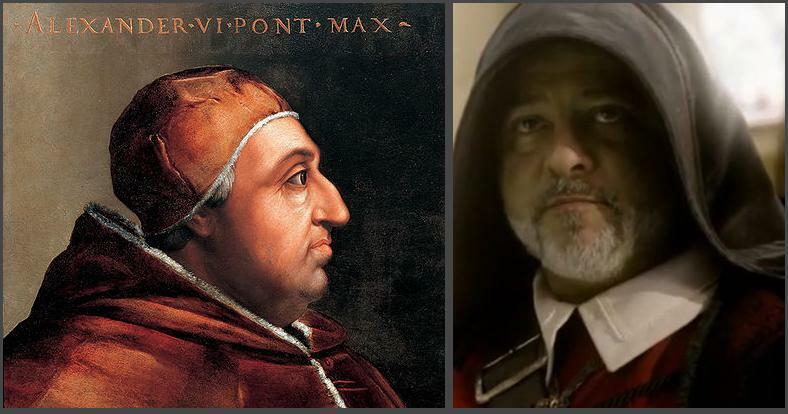 Borgia himself became Pope in 1492, serving as Pope Alexander VI, which is also referenced in the final section of the game - with Ezio sneaking into a heavily guarded Vatican and making an attempt on Borgia's life during a sermon delivered in the Sistine Chapel. Being 1496, the ceiling is not yet graced by Michelangelo's fresco - though the game depicts it as blank - when it was actually adorned with a star patterning by Piero Matteo d'Amelia. Manuel Tadros plays a very cunning Rodrigo Borgia/Pope Alexander in the game and film Lineage. Pictured left is a portrait of Alexander VI. 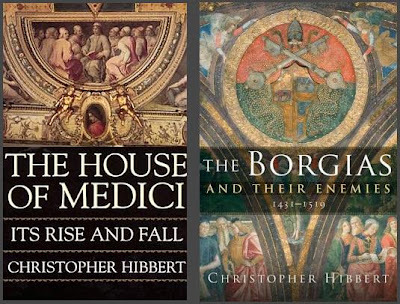 For some great reading about the Borgia and the Medici, Christopher Hibberts' The House of Medici: Its Rise and Fall and The Borgias and their Enemies are highly recommended. Achieving that perfect balance between quality of detail and ease of reading - they provide the full picture of what the portrayals in games and movies are stylised echoes of. In addition to this, please take some time to look at The Medici Archive Project. It is an international project, encompassing ongoing work by experts to create a universal archive of Medici documents for use by historians, and for posterity. Finally, the game itself... Assassin's Creed 2 was released in 2009 across multiple console platforms and in 2010 on PC. It can be purchased online in digital format(for PC) or at local game stores. It is one of the rare examples where history shapes the game, and not the other way around. For those curious, playing the original Assassins Creed is not required to be able to jump straight into the Renaissance. I love Renaissance Florence, and I look forward to playing this game once they get the DRM issues addressed to my satisfaction. Lorenzo di Medici is one of my favorites from the Middle Ages and Renaissance, along with Eleanor of Aquitaine and Queen Elizabeth I. Seeing Medici politics played out in game will be fun. Hibbert was a fine writer. I read his book on the French Revolution for a history class, and quite thoroughly enjoyed it. He has a writing style that is engaging and interesting, and certainly does not fit the typecast 'dry historian' role. Lorenzo was indeed fascinating! A true student of Antiquity. His patronage of Botticelli in particular, and works such as 'La Primavera' and 'Birth of Venus' tell us much about the Classical Learning of which he, and scholars such as Barbaro and Machiavelli were so proud. There is an interesting attempt at re-creating Lorenzo's true appearance on YouTube. You can find it by searching there for Lorenzo de Medici.